This is a cute picture book by Karl. I have zero knowledge of Spanish. This story helped me learn a few Spanish words. Being an Indian, my kids loved the illustrations and of course the new words in a new language. The plot revolves around the mystery of crumbs on the stairs and everywhere. For further details please do read the story. Yes the writing is simple. And as a non-spanish speaker I loved the illustrations, the way the translation helped in my understanding. Like I said, my children loved it too. Spanish is neither our mother tongue nor the language we speak. The writings in this book definitely piqued our interest in the language and I will soon be probably enrolling myself for a 'Learn Spanish' course. The images are vibrant and I loved the way the pictures could 'speak out' to the reader. The real protagonist of the story is the storyline itself. The characters and illustrations perfectly execute the same. 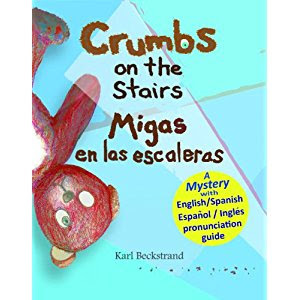 To sum up, this story is a must read for those who want to get a glimpse of the spanish language and for children to learn the art of being selfless through a short whodunit kind story. P.S - Thank you Karl for yet another excellent story with amazing illustrations. This review is my honest opinion after reading the story.